Try Campanology instead. Less energetic. ispy I would've thought bellringing wpuld have 'a peal' . Did you hear about the monk ringing the bell in the monastery. His habit came open at the front and the bellrope got fast round his old man. He got tolled off . They've been well at it earlier (Mon Eve) at the Parish Church. Which, incidentally, has an big clock that is more or less 1 min 25 seconds slow. Perhaps practising with dumbbells first might help, I-spy. It's good to have you back. Thinking about bell ringing - if I had the opportunity I'd grasp it with both hands. Never yet had me hands on a sally. Why not, I-spy?! Hope you can give it a ringing endorsement second time round. I give up.It's driving me bat-ty. On the left, inside the Anglican Cathedral Tower & on the right, bells of the Metropolitan Cathedral. I haven't taken up bell ringing or calling to prayer as yet, I-spy, so remain a rebel without a cord/call. Have you made moves to ensure there will be peals in our time? 'We are in the process of rebuilding our band of bell ringers. Dostaf - any further news of the times and chimes of Wigan Parish Church? Ringing bells could signal the right time and the rite time, Mache. One minute fifty five (ish) slow at the moment. A rung made a flight. that got me thinking priscus and I can't remember a single doorbell in our street when I was a little 'un. Yes, when I whur a kid, we had a shop. 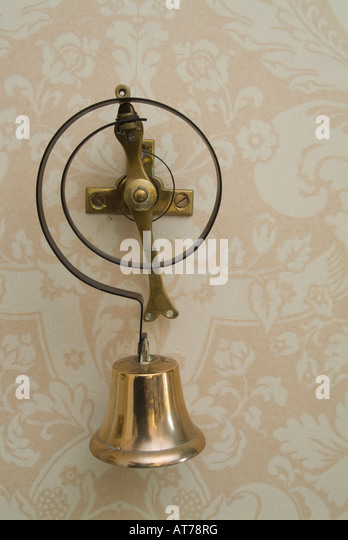 Shop bell, was first door bell known to me, and it was activated by a system of piano wire running over pulleys. Like the posh Victorian houses' bell pulls that are still occasionally evident. A bellringer who was flung into the air and fell 20ft during a practice session is suing the church. Steven Tomsett broke both ankles in the accident when he was wrenched off his feet while bellringing. “I was pulled quickly up into the air and just remember looking down and seeing everybody’s faces looking up at me,” Mr Tomsett said. Back in the early 1970's, I watched them re-cast a bell at Taylor's Bell Foundry, in Loughborough. I believe it was for a cathedral in Czechoslovakia. Fascinating, unchanged ancient technology. Recipe for the material used to manufacture the mould a secret, but I recall horse dung being amongst the ingredients. Took days to cool down. Then, tuned entirely by ear. Bell too big for any lathe of which I am aware, so the cutting tool itself mounted on apparatus to constrain it to a circular locus. The place is now the only remaining bell foundry in Britain, and also a working museum. The Laura Spellman Rockefeller Memorial Carillon, at The Riverside Church, Upper Manhattan, New York City has 74 bells. I do not know if this is a record. Anyone know of a tower with more than 74? Didn't know The Whitechapel foundry had been sold. Just looked it up, not half some history there. Well, I have learned that 74 is not a record. There are a couple of towers with 77 bells. One in US, and one in South Korea.